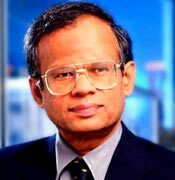 Dr Thilak Gunatillake was one of the key scientists involved in the design and synthesis of polyurethane biomaterials Elast-Eon® and NovoSorb®. AorTech and PolyNovo Biomaterials, two spin-off companies based in Melbourne, are commercialising the two technologies for biomedical devices and implants. Dr Gunatillake joined CSIRO in 1988 to initiate a research program to improve the fundamental understanding of how synthetic polymers degrade in the biological environments and to develop new materials suitable for medical devices and implants for long-term implantation. He graduated from the City University of New York, USA and conducted research on novel polymerisation methods prior to joining CSIRO. During the early part of his CSIRO career, Dr Gunatillake focused on understanding the structure/property relationship of polyurethanes and their influence on biocompatibility and their performance in the biological environment. He designed and synthesised new polymers to suit implants to last a longer time in the body or to degrade in a specific time frame. His research over the past ten years has been focused on transforming basic research discoveries to successful commercial outcomes. In 2004, he was seconded to PolyNovo Biomaterials as the Chief Scientific Officer.